It's time for one of our favorite fundraisers of the year -- the Aids Council of Northeastern New York's Dining Out for Life event. Here's how it works: You go out to eat. Well, that's almost it. You go out to eat at one of the participating restaurants this Thursday, April 26 and the restaurant will donate a portion of your bill to The Aids Council. There are lunch and dinner options available, and this year there are even some bakeries and dessert places in the mix. It's an easy way to do a good thing. 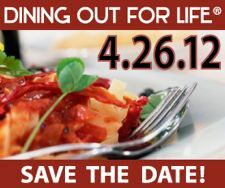 AOA is a media sponsor for Dining Out for Life. And we're adopting Mingle on Delaware Ave for this year's event, so we hope you can join us there. We've reserved a table for 25 people at 6 pm, so if you'd like dine with us, just RSVP here. Last year's event was a lot of fun, so we're looking forward to meeting some new folks and spending time with old friends. If you can't make it to any of the Dining Out For Life events, but would still like to help out, you can make a donation here. Join me for dinner at Bombers Burrito Bar in Schenectady. It's Trivia Night, so come on out, have a blast, and watch a portion of the proceeds go towards fighting and preventing AIDS in the Capital District. Sounds like a great night to me! Just wanted to say thank you for being a lovely Dining Out for Life ambassador, and welcoming us to the restaurant. (Even though we were not with your group, we came there with the idea that if AoA had chosen it, it must be good!). Also, Mingle was donating 25% of ALL SALES - very generous! and with the crowd there, I hope the AIDS Council received a substantial donation. It was our first time at Mingle, and while Food Buddy and I dine out 2-3 times a week, I cannot remember having such an all around enjoyable dinner. The service was professional and friendly, the hostess, and the manager checked in on us as well and despite not making reservations till about 3pm for a 5:45 dinner, they found us a nice spot in the back room. Just echoing the thanks - a three year-old with a dinosaur proved to be an excellent icebreaker, and the company was splendid all around. Thanks, y'all.